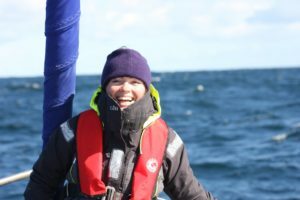 This week Lucy Hunt tells us how she felt the fear but made her dreams of setting up a marine awareness centre happen anyway! What inspired you to pursue a career in marine conservation? My love of the ocean and the joy, peace, freedom and wonder the ocean gives me. Everyday learning something new about the ocean and knowing it offers us so much and that we need to protect it and its inhabitants, not just for them but also for ourselves as we rely on it so much! The ocean has given me so much I want to give something back to the ocean and help protect it. What steps did you take/are you taking to achieve your career goals? 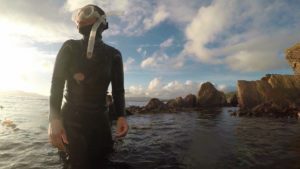 Undertook my BSc in marine biology/zoology and then my Masters in Marine Environmental protection, now in pursuit of a Phd in Marine Education, but most importantly gained experience in the field and with people throughout. Every college summer I would work in my parent’s restaurant to make money to go on internships all over the world in marine research and conservation, learning methods in marine research and education with all walks of life from fishermen to school children and coastal communities. Also very important, continually learning through self-awareness & self-development to give me the confidence to follow my dreams! How did you land your current job/position? I felt the fear and did it anyway! I had wanted to set up a marine awareness centre for a few years it was a dream, but always had questions; was it the right thing to do/would it work etc etc. So I went out and did it, reached out to the right people and saw a synergy within my community to make my dream happen – TADA Sea Synergy Marine Awareness & Activity Centre opened in July 2014. Support-encouragement from friends and family was very important when starting out. Which part of your job do you enjoy the most? Sharing the ocean and what I know about it with others. Guided Boat trips, guided snorkelling and school visits. Also love research trips with the Irish whale and dolphin group! Are there aspects of your position which make you feel that you are really ‘making a difference’? 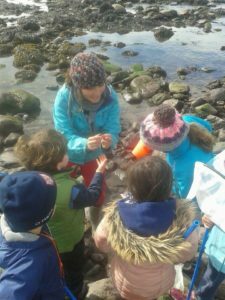 The marine conservation and awareness work I do – especially when I have parents telling me that their children are now doing beach cleans by themselves. Or when I tell adults about things like microbeads and they never knew anything about them but they will for sure change their actions due to the damage they cause. Every summer hundreds of teenagers come on workshops and we always do a beach clean. What do you know now that you wish you knew when you were starting out? Are there any skills you never thought you would need but did? What advice would you give to budding marine conservationists? Try different conservation areas, go out and get experience in the field and with people, you can do it, follow your dreams! What is your favourite marine creature and why? Too many to choose from, but some that really stand out; basking sharks, jellyfish, cowrie shells, broad claw porcelain crabs, manta rays, seahorses, starfish, sea urchins – see too many!! What is your most unforgettable moment in the sea? Too many to choose from but some that really stand out; snorkelling with basking sharks for my first time off the headland at home, Co. Kerry Ireland, scuba diving with manta rays and whale sharks in Maldives, scuba diving with hammerheads in Galapagos, snorkelling with jellyfish and watching their elegant movements, night snorkelling amongst the bioluminescence, all glowing in the summer at home in Kerry, full moon foraging and seeing 100’s of starfish out and crabs mating! Thanks for the great advice Lucy and what a great read! Sea Synergy Marine Awareness & Activity Centre have volunteer positions for 2017 up for grabs. Follow Lucy’s advice and Volunteer. Don’t forget to sign up to our weekly job alert email for the latest marine conservation opportunities. Various organisations and individuals kindly contribute guest blogs for us on a regular basis, we hope you enjoy!